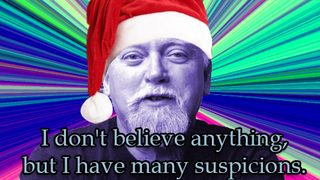 In 2007, Pope of Discordianism Robert Anton Wilson reflected on a 1990 North Carolina case where a church put Santa Claus on trial for being a heathen mischief-maker. In the article, Wilson performs the neat trick of a relatively short and tidy deep-dive into the history of the jolly old elf, in which he explores the icon's history as a deity in pre-historic cave paintings; as a bisexual figure who appears as both males and females in ancient Greek, British and Celtic mythology (I think he may mean trans-sexual); as a bear-god fertility symbol (what would Colbert say? ); and incarnate in Charlie Chaplin and Hannibal Lector, among many other iterations. He also seems to have a healthy suspicion of Anthony Hopkins in general. Let RAW illuminize you over at 10 Zen Monkeys.